And what happens if the person next to you does not properly secure their bike and yours ends up getting damaged? Who is responsible then? It would be intersting to read the T's and C's on the ticket regarding damage to vehicles on board. Here is Oz there is only one ferry trip where vehicles have to be secured the ferry from Melbourne in Vivtoria to Devonport in Tasmania which is about 8 hours and it can be incredibly rough (like 4 -6 story high waves) or dead smooth. The ferry company tie everything down themselves when you ride on. Seems to change all the time & whichever line/boat you're on. I been on the; Dover/Calais, Dover/Dunkirk, Dover/Folkstone, Portsmouth/StMalo, Roscoff/Plymouth, Hull/Rotterdam, Hull/Zeebrugge, Heysham/Douglas, Holyhead/Dun-Loaighaire, Livorno/Bastia, Ullapool/Stornaway, Portsmouth/Ryde & several small hang onto your bike Scottish ferries. Sea France were best with special bike bays, 2 boys one each side strapped us down by pillion hangers in one minute. Mobyline took bikes & lashed to bulkhead, scary. DFDS sometimes ratchets sometimes ropes, diy. The deck hands used to do it. 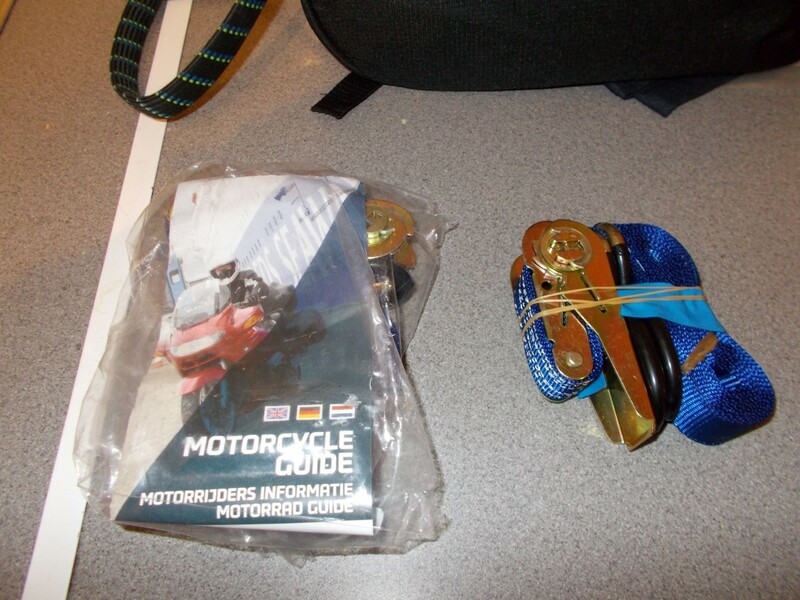 P&O Hull/Rott gave us big ratchet straps before we got on boat, had to stuff the heavy dirty things inside jackets to ride on. Recently P&O have ropes or ratchets hanging about, depending on deck & boat, all diy. Sometimes there are wheel chocks knocking about. Otherwise tie sidestand to front wheel spindle. A bit worrying when you get somebody next to you who doesn't know how to do it. Stena & Irish Ferries - Hollyhead and Rosslare to whereever both tie down themselves. I usually have some cardboard to go over the seat but usually not needed as the deckhands have foam padding for that. And by tie down I mean TIE down rock solid tie down.